Serial phone leaker Steve Hemmerstoffer (@OnLeaks) has shared another alleged leak of Apple’s next-generation iPhone, presumably scheduled to launch around September this year. The shared picture, above, depicts handset chassis schematics alongside a CAD rendering of an iPhone, all with a large patch on the rear of the device that appears to house three lenses. Hemmerstoffer says the leak supports his claim that at least one version of the next iPhone will feature a rear triple-lens camera system in a triangular configuration, based on information he has sourced previously. Rumors about triple lenses in an iPhone began as far back as May 2018, while well-known Apple analyst Ming-Chi Kuo said the same thing in October. 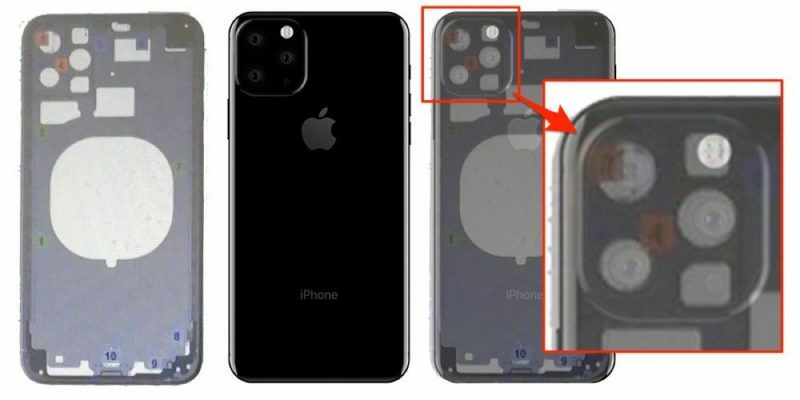 In January, Hemmerstoffer released renderings of the supposed iPhone 2019 model, with a similar unusual-looking patch on the rear for three lenses, a flash, and a mic. A few days later, The Wall Street Journal reported that Apple is planning on introducing a triple-lens camera system in at least one of the iPhones coming in 2019, while Bloomberg seemingly confirmed the rumor later the same month. Based on the two reports, the second-generation iPhone XS Max will feature a three-lens camera, while the successors to the iPhone XS and iPhone XR will continue to use dual-lens cameras. However, neither report mentioned how the lenses would be arranged on the rear of the case, and other rumors have suggested Apple is planning to use a horizontal triple-lens camera layout. At any rate, a triple-lens rear camera would allow for a larger field of view, a wider zoom range, improved low light performance, and it would capture more pixels. Hemmerstoffer has previously claimed that one rear camera will be 10 megapixels, while a second will come in at 14 megapixels. The details of the third sensor are apparently unknown. Early rumors suggested Apple would introduce 3D depth sensing technology for the rear-facing camera, but that’s apparently been delayed until 2020.